Thank you, quick to ship! First class seller. Recommend to others. Basics: ok for low end pricing only! Do not pay over $50 bucks! Period. INDOORS, fine but expect a long noisy feeding period..too slow to feed..food has gotten stuck and stopped working with error on screen. Was away when happened. Not good. Through testing..it worked but was not thrilled beyond what I paid for two of them. OUTDOORS: NO WAY...best be above ground more then 3 ft. Even then expect possible ant issues. Not rain resistant so keep under a covered area. The two times used while gone away I came back to questioning how much and if at all dogs were fed. Number of days, feeding times, amount and correct time were set with enough food plus a little exstra to be sure. Returned to find food was still about where it was when filled it and screen was flashing scheduled time. Also with new batteries when gone away. Yet testing them over and over they seem to work fine but slow to feed so I know it's not me setting it wrong. Overall if you stay at home, feed inside and will know it's working or has an error, ok, but wouldn't give a dime over the $50 with shipping I stayed earlier. 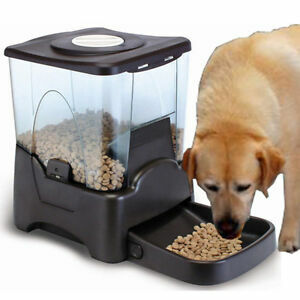 If you travel and have to rely on this unit to feed your family member animal until your back. Forget it. It's not worth the piece of mind you won't have while gone. Pay the neighbor to feed. So with that said, yes I think it is worth the $50 for the right personal need and holds some value within that need. Other then that pay alittle more after reviewing others that are more expensive. bought this feeder to feed our cats in our breeze way but is not critter proof. would be good for indoor pets. I thought it was overly difficult to program and was unsure if it would be dispensing when i needed it to. after watching it a couple of days to assure it was working right it was left to feed our cats. when we returned two days latter we found it had been raided and the entire hopper was off. So far it seems to be doing the job and is sturdy and durable quality. It is very difficult to program. I almost sent it back, because I couldn't program it. Got a couple of people to help me and finally got it done. I have had a different feeder and it wasn't nearly as hard to program and if I had to turn it off,it kept the program, just had to reset the clock.,which this one doesn't. Have to start all over. TO HARD TO PROGRAM. LOOKS GREAT AND QUALITY IS GOOD. There must be a better way to program the thing. Maybe I am just to old!! !